I guess the one reassuring thing is - the smaller batteries don't appear to have enough in them to do enough irreversible damage (only seems to corrode the contacts, which people are able to resurrect with some scouring or sanding), while the bigger ones do indeed leak out a lot more, the acid doesn't appear to do much initial damage to the plastic (could weaken it for the long term though) and unless the electronics are gravitationally below the batteries (or a hole or gap in the battery compartment) usually only the contacts will be damaged, which may well be resurrected as well with a bit of sanding. See the photos in the first post - the examples I gave show that the corrosion was limited to the contacts (Supreme Cheetor, Armada Jetfire gun), and where it was a complete acid leakage, it ran down out of the battery compartment away from the actual electronics (Armada Superpants Prime). The worrying thing though is that just about all the new moulds since 2006, have the bigger batteries now, not the small button cells... which is more prone to big leakage. Since they are (cheap) Hasbro-brand batteries, they might be worse, or maybe a type they've specifically created so that it doesn't leak. It might be too early to tell though, as it was more than 5 years before notable leaking occurred in my toys. They can't even improve on their toys which they've been doing for 25 years, how can they improve the batteries which is not their expertise? 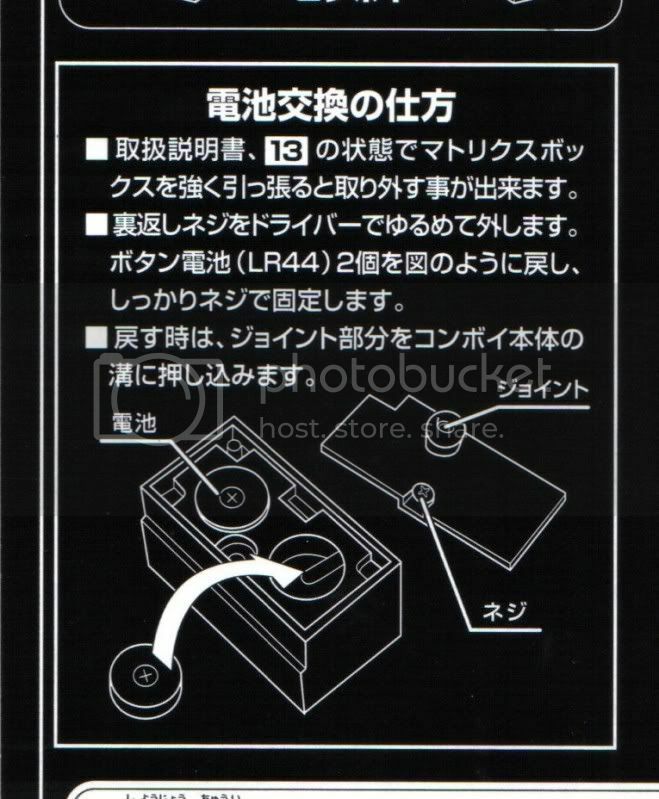 Here are the scans of the instructions. The batteries are in the rear of the box that holds the LED for the Matrix. You need to mess about with the Matrix box and pull it out a bit as you get to this step when changing from robot to vehicle mode. There is a way to take the box out, but it's not in the instructions, and my MP1 & 4 are packed away somewhere, sadly I just don't have the time to mess about with them ATM. If I do, pics will come as I have to check the batteries in MP4 I guess. I can't remove the box it just slides in both directions. Do you forcefully take that out? Or jsut try to insert a small screwdriver so that the top of the box is kept where it is and the bottom just falls out? For my MP 01 & 04, I forcefully pulled them out. But you need to do that with caution; the battery box itself won't be much affected. But you need to be aware of the parts around it: the chest doors, the flip boards above and under it, etc. Make sure there's nothing in the way when you pull it. And after you've got the batteries out just forcefully push it back in. That small red cap over the rivet is actually quite tough. With my MP 01, because it was my first experiment, after I've reinstalled the battery box it appeared to be a bit loose, and fell out itself. But there's no damage, and I just put it back again. I worked on my MP 04 more experienced and everything went perfectly, the same issue didn't recur. For figures with batteries I keep that paper/plastic tab in so the electricity doesnt flow. Does that count? It would help, but eventually all batteries leak. My Cybertron Megatron had a teeny bit of brown on it and the screws were slightly rusted. Chucked 'em and I don't think I'll put any more in there again. Time to retire ol' Megs. wow didnt know that at all...lucky i found this thread...taking my MP batteries out now ! !